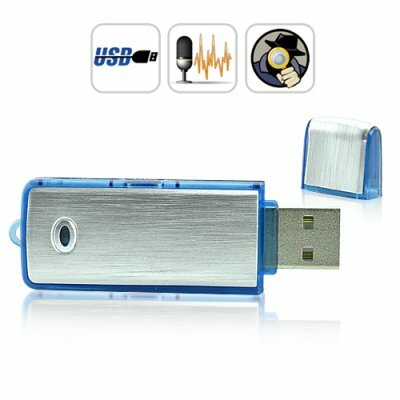 Successfully Added Flash Drive Audio Recorder - 240 Hours to your Shopping Cart. In business you can never be too careful. Remember that time the supplier promised you they'd deliver your order immediately but never followed through on their oral contract until MONTHS later causing you untold financial and time loss? And even when you referred to their previous promise, what was their reaction? "I NEVER said THAT!" You were so furious but what could you do? You kept telling yourself, "if only I had recorded that damn conversation I could sue their sorry asses and get my money back!" Well now you can with this great flash drive audio recorder that stores up to 240 hours of recording! No software installation. No cables. No batteries. Just press one button and start recording. And with its innocent look as a USB flash drive, nobody will ever suspect that you are recording the conversation. When you finish, stick the flash drive into your computer to instantly listen to what's been recorded. Easy peasy! What's more, you can also use it to record meetings, press conferences, talks with employees, lecturers and more - all with maximum ease and convenience. At a fraction of cost of same class bulky gadgets, this Flash Drive Audio Recorder is now available in stock for single or bulk purchases. Add it to cart now and it ships to you within one day. Brought to you by your source for cool gadgets – Chinavasion!